THIS SYSTEM INCORPORATES A VOLTAGE SENSITIVE SWITCH (E1040) WHICH CAN BE PRE-SET TO SWITCH ON WHEN THE ALTERNATOR VOLTAGE IS DETECTED, PREVENTING THE CRANKING BATTERY FALLING BELOW CRANKING VOLTAGE. WHEN THE ALTERNATOR VOLTAGE IS DETECTED, THE VOLTAGE SENSITIVE SWITCH SUPPLIES +12V TO THE CONTROL WIRE OF THE 80A BATTERY CHARGER (E1108) WHICH IN TURN SUPPLIES CHARGING VOLTAGE TO THE 24V BATTERIES. WHEN THE BATTERIES BECOME FULLY CHARGED, THE BATTERY CHARGER WILL AUTOMATICALLY GO TO TRICKLE CHARGE AND THEN STANDBY MODE. 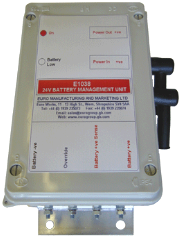 THE 24V BATTERY SUPPLY IS FED INTO THE E1038 BATTERY MANAGEMENT SYSTEM (BATTERY MONITOR), WHICH MONITORS THE 24V LOAD TO THE AUXILIARY EQUIPMENT. SHOULD THE 24V BATTERIES FALL BELOW THE PRESET VOLTAGE OF THE BATTERY MONITOR, THE LOAD WILL BE DISCONNECTED AFTER A PRESET WARNING TIME. THE LOAD WILL NOT BE RECONNECTED UNTIL THE 24V BATTERY VOLTAGE REACHES THE PRESET SWITCH ON VOLTAGE OF THE BATTERY MONITOR. AN OVERRIDE SWITCH IS PROVIDED – THIS IS FOR EMERGENCY USE ONLY. IT SHOULD BE NOTED THAT THE PRESET SWITCH ON AND OFF VOLTAGES OF THE BATTERY MONITOR CAN BE SET TO SUIT ANY APPLICATION. A 12V + 24V BATTERY STATUS INDICATOR (E1107) IS LOCATED IN THE CAB TO ALLOW THE DRIVER TO VIEW THE STATUS OF THE 12V CRANKING BATTERY OR THE 24V LEISURE / SECONDARY BATTERY AT ANY TIME.